This event provides researchers, PI's, lab managers, professors, post docs, grad students, purchasing agents, and other lab staff the opportunity to meet face-to-face with sales reps in a professional and friendly environment. Instead of traveling from door to door and interrupting your work, sales reps from different companies will be in one room, making it convenient for you to speak with them on your own time to learn about new products and services available that will benefit labs and research. Take a break from your research and come out to the event to see what is new in the world of life science supplies, get your questions answered, and learn about new tools and technologies available to use in your lab on Wednesday June 3rd, 2015! 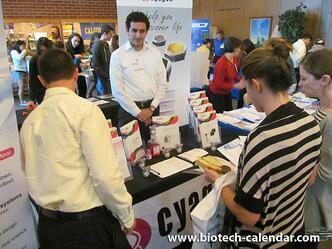 Researchers at the 2014 BioResearch Product Faire™ Event learn about new lab supplies. At this event, you not only have the opportunity to find new supplies, but you also have the chance to win door prizes, collect giveaway items and enjoy lunch. 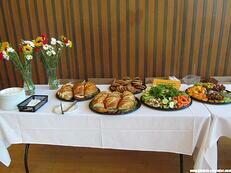 Enjoy a complimentary buffet of bagels, sandwiches, pizza, fruit and veggies, coffee and lemonade. 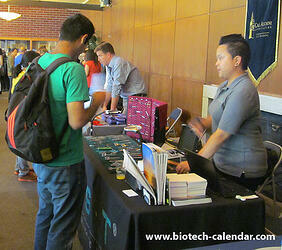 Pick-up a fun door prize before you head back to your lab. Enter to win a FitBit. Arrive early and grab your very own #ScienceNinja t-shirt (first come, first served). Come after 1:00 p.m. and have the chance to take home a #ScienceNinja lab coat. SAVE THE DATE: Wednesday, June 3, 2015 from 10:00 a.m. - 2:30 p.m.